The Club’s next Open Day will be on Friday 20 September 2019 from 2-8pm. Please come along and have a try and see our successful club. The Club will hold its next Open Day on Friday 14 September between 2 – 8pm. Open to all ages and all abilities, whether you’ve bowled before or not, please come along and give it a try – you never know you may like it! Bar and tea/coffee facilities will be available throughout the day. On Saturday 9 December the annual Christmas Gala Day took place at the club. There was a lot of support from members and the fancy dress was certainly something to behold! Next year we want even more people to come along and support such a great afternoon with fun, bowls and prizes! 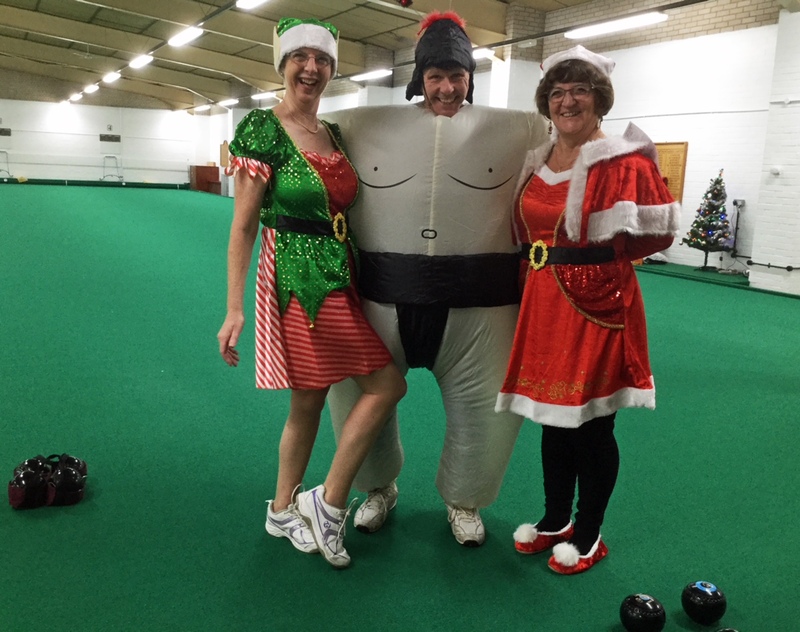 Diane Makepeace was the winner of the fancy dress competition with her ‘Little Elf’ costume and here is a picture of her winning costume (featuring Alan Waters as Super Sumo and Ros Corke as Lady Claus). 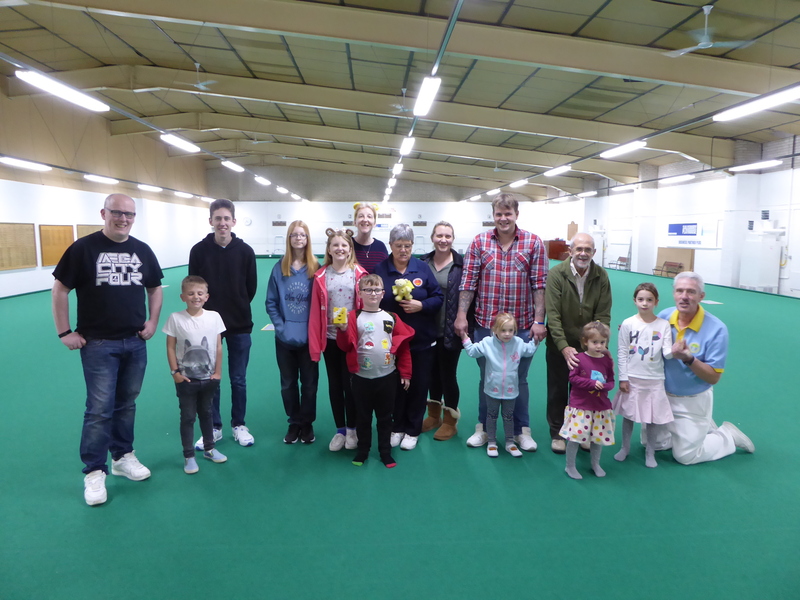 On Sunday 19 November several children visited the club for a fun afternoon in aid of raising money for Children in Need. It was the first time the club has done something like this and we received several positive comments and managed to raise £74 for Children in Need, which is a fantastic effort! Next year the club wants to make it bigger and better and so your support is greatly appreciated. Our JUNIOR CLUB are holding a recruitment afternoon on Sunday 19th November from 3 – 5 pm. Described as a Family Fun afternoon to encourage any youngsters to try bowls. There will be free refreshments (tea and coffee), bowls games and a raffle. All proceeds are going to the BBC Children in Need appeal so any help (money) or simply getting involved, speak to Marian, Fraser, Jamie, Mike, Louise (07848 181165) or Jack. Posters will be up in the Club and Louise has placed adverts in the Wilton area, a couple of local schools, the library and Spire FM but you can pass the message to any family you think might be interested. The Club is hosting an Open Day on Friday 15 September from 2pm – 8pm. Please see the poster below for all details and we look forward to seeing you there! The Club is situated in Salisbury and is a friendly four rink indoor bowls club with over 250 members ranging in age from 8 upwards.